Micromax has revealed its latest device Bharat 2 targeted towards low-budget segment. The device will be developed in partnership with Spreadtrum. 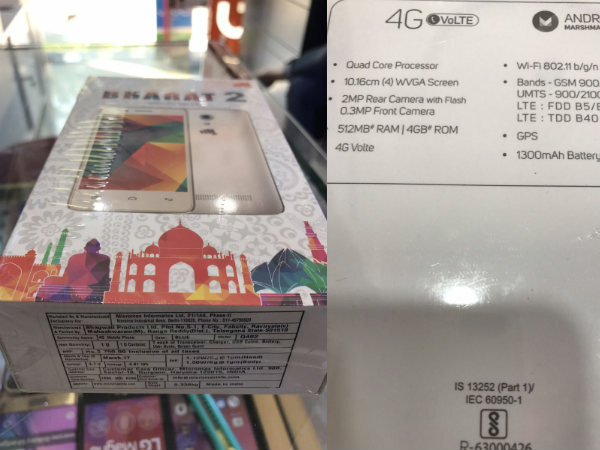 Micromax recently launched its low budget smartphone named Bharat 2 which is a Google certified phone at a meager price of Rs.3900. The Bharat 2 smartphone comes with all the features that are essential for making the country digitally empowered despite geographical and socio-economical differences. The 1.3 GHz Spreadtrum SC9832 SoC offers five different modes such as GSM and GPRS, HSPA+, WCDMA, TDD-LTE, and FDD-LTE. This makes the chipset compatible with all the latest technologies such as the 4G with VoLTE, Bluetooth 4.0, Wi-Fi (802.11 b/g/n), and GPS. According to Leo Li, the chairman, and CEO of Spreadtrum, the company is delighted to work alongside with Micromax as it is one the leading smartphone makers in the country. He also said that the Spreadtrum SC9832 SoC loaded in the Micromax Bharat 2 smartphone will make high-speed 4G VoLTE connectivity more affordable for the Indian users. Thus the smartphone will take the country forward in its vision for digital empowerment breaking the socio-economic and geographical barriers with Spreadtrum expressed CEO Li. Vikas Jain, the Co-founder of the Micromax Informatics Ltd also expressed that he is delighted about their partnership with Spreadtrum for Bharat 2. He also added that the smartphone will come up with the next set of tangible innovation for the Indian users. The Micromax Bharat 2 is a Google certified Android handset that runs on a 512MB of RAM and 4GB of ROM. Users can expand the phone’s memory up to 32GB using a microSD card. The smartphone also comes with a 2MP rear camera with LED flash and a front VGA camera.